(Reuters) – As club sandwiches go, this undoubtedly is the biggest one in the solar system. 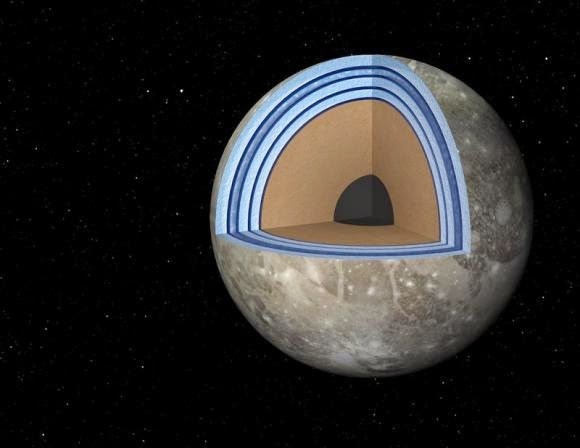 Scientists said on Friday that Jupiter’s moon Ganymede may possess ice and liquid oceans stacked up in several layers much like the popular multilayered sandwich. They added that this arrangement may raise the chances that this distant icy world harbors life. NASA’s Galileo spacecraft flew by Ganymede in the 1990s and confirmed the presence of an interior ocean, also finding evidence for salty water perhaps from the salt known as magnesium sulfate. A team of scientists performed computer modeling of Ganymede’s ocean, taking into account for the first time how salt increases the density of liquids under the type of extreme conditions present inside Ganymede. Their work followed experiments in the laboratory that simulated such salty seas. While earlier research suggested a routine “sandwich” arrangement in which there is ice at the surface, then a layer of liquid water and another layer of ice on the bottom, this new study indicated there might be more layers than that. Ganymede boasts a lot of water, perhaps 25 times the volume of Earth’s oceans. Its oceans are estimated to be about 500 miles (800 km) deep. “Our understanding of how life came about on Earth involves the interaction between water and rock. This (research) provides a stronger possibility for those kinds of interactions to take place on Ganymede,” added Vance, whose study was published in the journal Planetary and Space Science. “We’re providing a more realistic view into ocean structure in Ganymede’s interior. We’re showing that the salinity has a tangible effect on the ocean,” Vance said.